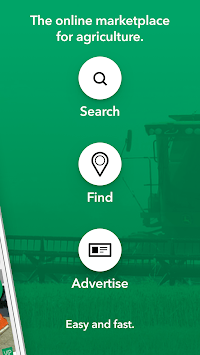 Find the perfect equipment for your farm in more than 25,000 classified ads and 65,000 offers in our second-hand market with the Landwirt.com marketplace App. Our App offers the entire range of the corresponding website www.landwirt.com, THE online marketplace for agriculture. 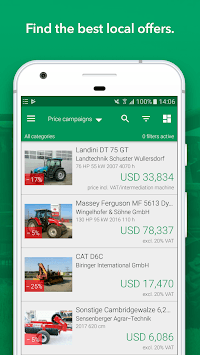 The Landwirt.com App helps you to search specifically for classified ads, offers and deals in your local community (between 0 and 500 km). Contact the advertiser directly through the App and avoid unnecessary transportation by buying in your own region. You are searching for something or you want to sell something? 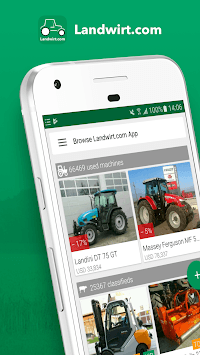 The Landwirt.com App and website allow you to present your classifieds quick and easy to the right people. And the best thing about it is: Publishing your classified ads and advertisements as well as using our App is completely FREE! Interested parties are able to browse through our ads or to directly search for your offer. If somebody shows particular interest they can open the detailpage of the private ad to get more information regarding the offer. Buyer and seller can contact each other directly via the App. Our App promises benefits both for buyers and sellers. You are searching for quite a special machine? No problem, select the fitting offer from the comprehensive range of our used machinery dealers and get more information directly in our marketplace. Our App provides you with an exceptionally clever search engine for used machines. Browse through categories or optimize your results with various search criteria like brand, price, PS / kW, year of construction, operating hours, tyres, working width etc. Find offers from Austria, Germany, Hungary, Slovenia, Italy or Switzerland. Once you have discovered your desired offer you can view the exact location of the offered machine on the map or contact the seller right away. The simple and clear user interface of our App enables you to find the best offers, machines, tractors and vehicles always and everywhere. Landwirt.com is the best place to search purposefully for agricultural technology, used machinery, agricultural machines and farm supplies. We provide countless categories such as tractors, tractor equipment, crop cultivation, trailers, construction machinery, commercial vehicles, flea market and many more. Find everything for your farm with Landwirt.com. ► Videos about agricultural technology, crop cultivation, horses, pigs etc. Those who haven’t found what they are searching for are looking in the wrong place! Simply download the Landwirt.com App and benefit from our comprehensive range!